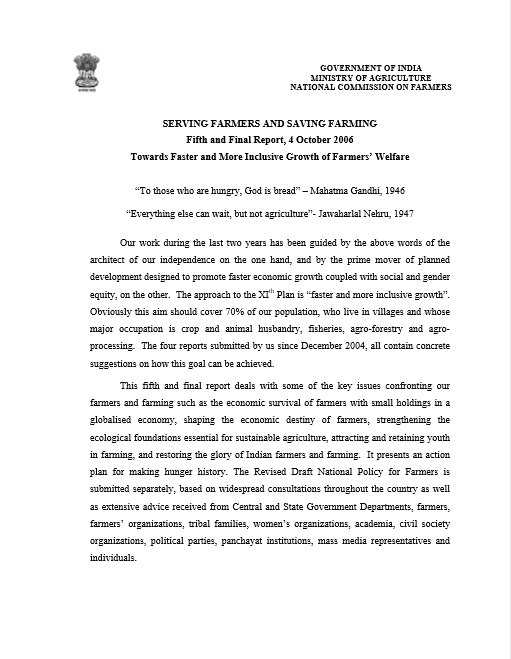 SERVING FARMERS AND SAVING FARMING: TOWARDS FASTER AND MORE INCLUSIVE GROWTH OF FARMERS’ WELFARE – FIFTH REPORT, VOLUME II - Dilli Chalo! The eight-member National Commission on Farmers (NCF), chaired by Prof. M.S. Swaminathan, was set up in 2004 by the United Progressive Alliance (UPA) government to assess the extent of India’s agrarian crisis. The Commission held 37 formal meetings over two years between 2004 and 2006, as well as technical consultations with individuals, groups and government officials in various parts of the country. It produced five reports (the fifth of these in two volumes) and presented two drafts of a National Policy for Farmers to the government. The revised draft policy was developed in consultation with central and state government departments, farmers, farmers’ organisations, tribal families, women’s groups, academia, civil society bodies, political parties, panchayat institutions, mass media representatives and individuals. The second volume of the fifth report, submitted on October 4, 2006, to the then Minister of Agriculture Sharad Pawar, reiterates the need to address India’s agrarian crisis and revive the pride associated with farming “as a way of life and as a means to livelihood.” It also summarises all the state-level consultations organised by the Commission that ultimately led to the Revised Draft National Policy for Farmers. The National Commission on Farmers (NCF) held 22 state-level consultations between May and September 2006. The topics discussed were land, water, livestock, credit, insurance, technology and inputs, markets and other key sectors, and the crops specific to each region. The feedback on the Draft National Policy for Farmers at these consultations included having at least one woman in the NCF and an agriculturist as its co-chair. It was also argued that farmers must be adequately represented in policy-making bodies. One of the suggestions at the Andhra Pradesh consultation was that the NCF shouldn’t be wound up. It should oversee and monitor the implementation of its recommendations since previous commissions had not done so. A similar concern about implementation was expressed at the Punjab consultation. At the consultation for Assam and the North Eastern states, it was observed that the Draft National Policy for Farmers needed a separate section on the North East. Other suggestions included district-level agricultural parks with processing facilities and market linkages, inclusion of pig rearing in farming, and the coordination of forest and agriculture policies. At the Pune consultation, it was suggested that the definition of farmer be extended to include rural artisans or service providers who meet the agricultural needs of villages. At the Odisha consultation, some farmers, particularly young ones, said that banks and government officials were not courteous and respectful with them because of their occupation. This issue – related to the dignity of farmers – was highlighted as an important problem. The Maharashtra and Goa consultation observed that agriculture was an activity in the service of the nation and needed a special budget. At the Andhra Pradesh consultation, it was said that since 68 per cent of the population was involved in agriculture, at least 68 per cent of the budget should be allocated to agriculture. At the Punjab consultation, it was felt that the current investment in agriculture must increase if its declining share in GDP was to be reversed. At the Kerala consultation, it was suggested that farmers’ rights be defined, special farmers’ courts be set up, and a constitutional body to hear farmers’ grievances be established. At consultations in many states, people welcomed the idea of state and central awards for successful farmers. It was felt that these awards would encourage farmers, recognise their hardships, and accord them respect. Since farmers had access to very little digital content, it was suggested at many consultations that this content should be made available to them in the local language. Factoids and Focus compiled by Samyukta Shastri. The Commission’s chair was Prof. M.S. Swaminathan and its members were R.B. Singh, Y.C. Nanda, Atul Sinha, Atul Kumar Anjan, Jagadish Pradhan, R.L. Pitale and Chanda Nimbkar.